The south of Spain has, in general, a mild climate when compared to the northern parts of the country. For me to tell you what the weather will be like when you arrive is a little like you asking Santa for a new car this Christmas: don't count on it, and if you get it don't thank Santa. Below you will find a local forecast for the immediate future, as well as a chart outlining the average temperatures and rainfall. When it comes to the summer in Granada it can be relatively hot. When you compare Granada's heat to any other city in Andalucia you should expect the temperatures to be milder thanks to the elevation and the Sierra Nevadas nearby. When we want to really escape the heat in Seville we head first to Granada, and then up into the surrounding mountain ranges where you can really notice the difference, especially at night. July and August are the hottest months, with possibilities for high temperatures also in June and September. Average temperatures can deceive a bit as it gets cool at night. It can be very hot on summer days. The coldest months in the city are December, January and February, when the average temperature hovers between 8 - 10° C (46- 50° F). The only time I have ever worn a true winter coat in Andalucia was in Granada. Temperatures can easily dip below freezing on some nights. The month with the most rainfall is certainly November. If forced to pick a "rainy season" I would say from November to mid February are when you have the best chances of a wet visit. With spring and April there is also a better chance of rain in the city and surrounding towns. 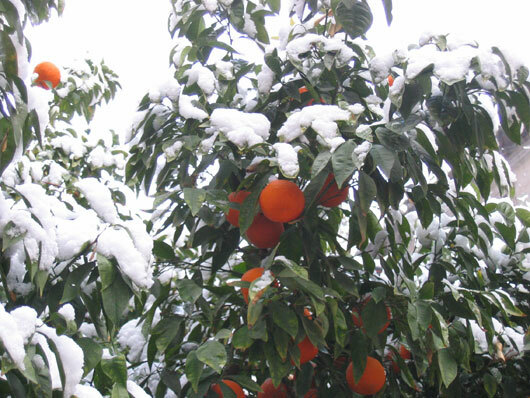 Unlike every other city in Andalucia, there is a chance it will snow in Granada! I have experienced snow in November, December, January and February, but that is not to say in October or March it won't happen. In the Sierra Nevadas it will snow as early as September and expect to see the highest peaks with snow up to 9 months out of the year.